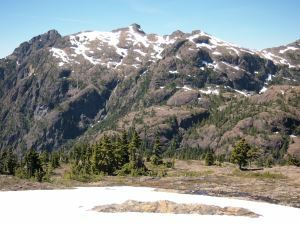 On the east side of Buttle Lake, at the head of Karst Creek; the Oyster River begins on the N slopes of this summit, and just W of Augerpoint Mtn. Ralph Lake is to the ESE down 900m or so of bluffs. There's a radio transmitter on the summit. Syd's first trip into Strathcona was in 1949, a fly in trip to Muchalat Lake and hiked out via Gold and Elk River Valley to Upper Campbell Lake. This gave Syd his first view of Buttle Lake, which was before it was flooded. Another hike of special interest was in 1952 when Syd went on a trip to Comox Glacier with, among others, the well known climbers and outdoors people Ruth Masters and Sid Williams. At this point he joined the Outdoors Club of Victoria and the Victoria Section of the Alpine Club of Canada. Syd led many trips with these groups. In 1958 Syd and Harry Winstone formed the Island Mountain Ramblers, a hiking group which had an Island focus. From 1958 to 1964 Syd, Jack Ware and Don Apps explored all the high ridge routes in Strathcona Park. Syd then documented these trails for the guide Hiking Trails 3. In 1959 Syd led the first post war trip to the Golden Hinde. Starting in 1965 he began the project of planning and building the Marble Meadows Trail which involved leading work parties until 1970. Syd was also involved in other trail building projects throughout the Park. It was in 1970 on a weeklong trip with Jack Shark that Syd and Emily climbed [Syd Watts Peak] for the first time.